Celtics forward Jim Loscutoff, second from right, in 1963. Jim Loscutoff, who spent his entire nine-year N.B.A. 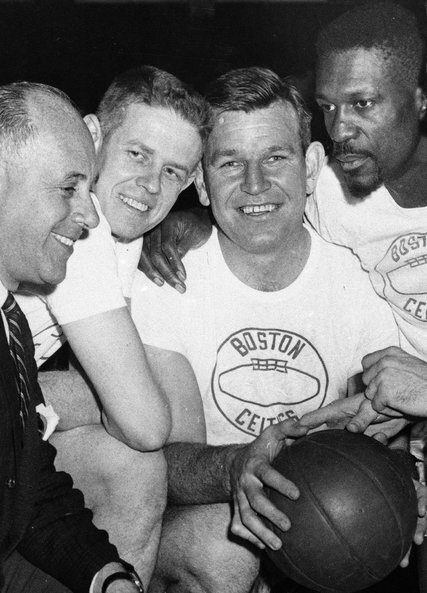 career with the Boston Celtics, playing on seven championship teams in the 1950s and 1960s, died on Tuesday in Naples, Fla. He was 85. The team announced his death but did not specify the cause. Loscutoff is the only Celtics player to have his name, and not uniform number, retired “for his leadership and all-around excellent play.” A banner with his nickname, Loscy, was hoisted to the rafters of Boston Garden in 1973. Also known as Jungle Jim, Loscutoff was the team’s first-round draft pick in 1955 out of Oregon, where he still holds the single-game record for rebounds with 32. A 6-foot-5 forward, he averaged 6.2 points and 5.6 rebounds in his career and was known for his aggressive play.